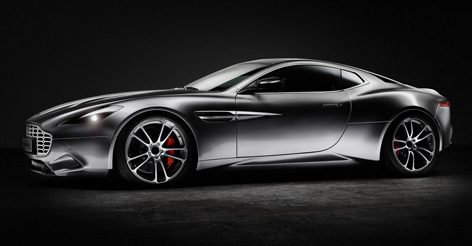 Henrik Fisker, designer of many sportscars including James Bond's BMW Z8, has revealed a new creation, the Aston Martin Thunderbolt. The Thunderbolt is only a design study, but if it is received well, a limited edition run of the model will be produced. The Thunderbolt's powerful exterior profile is the result of hand-laid, coach-built carbon fiber bodywork that incorporates Henrik Fisker's characteristic design cues such as a clean body side with no creases and deeply sculpted air ducting. The hood on the design study is dominated by a large power dome with long triangular sculpted air intakes and also incorporates fitment of unique head lamps; thin protruding, blade-like, tail lamps; a wraparound rear window and panoramic dark tinted glass roof; as well as updated exterior detailing including aluminum grille and assorted bright work. Performance upgrades include lowering the standard ride height of the car by 15 millimeters and fitment of 21-inch alloy wheels with performance tires. 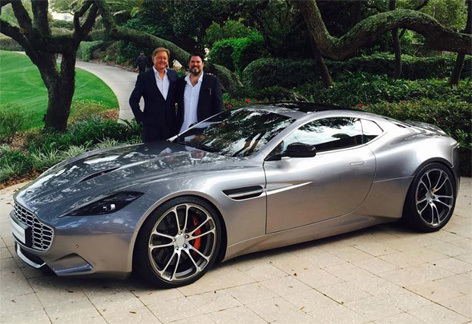 Fisker unveiled the Thunderbolt at last weekend’s 2015 Amelia Island Concours d’Elegance, where he described the car as a “powerful GT coupe” and said it was his “personal interpretation” of how his own Vanquish coupe could look like. 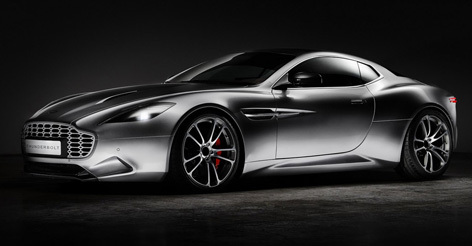 The Thunderbolt is in no way affiliated with, sponsored or endorsed by Aston Martin. 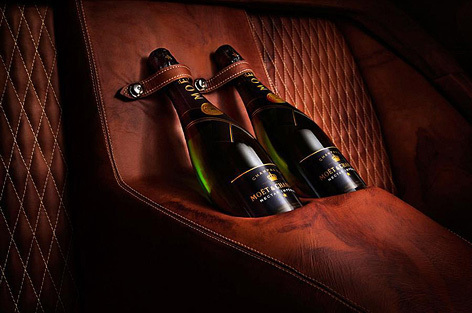 The Thunderbolt's interior features premium leather from furniture brand Natuzzi, a chronograph clock from Swiss watchmaker Maurice Lacroix, and - in proper James Bond style - a special bottle holder for some Moët & Chandon (or Bollinger) Champagne or wine. 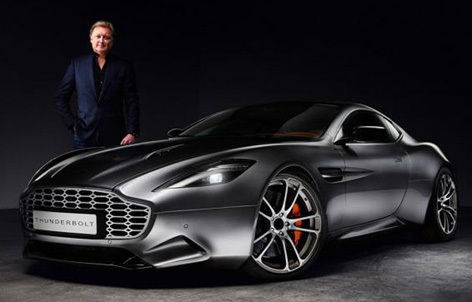 Henrik Fisker is the leading automobile designer and CEO of Fisker Automotive. He graduated from the Swiss campus of California's Art Center College of Design in 1989 and started his career at BMW in Germany, where he was recognized as one of the most celebrated automotive designers of the last twenty years, and worked for Aston Martin from 2001-2003. 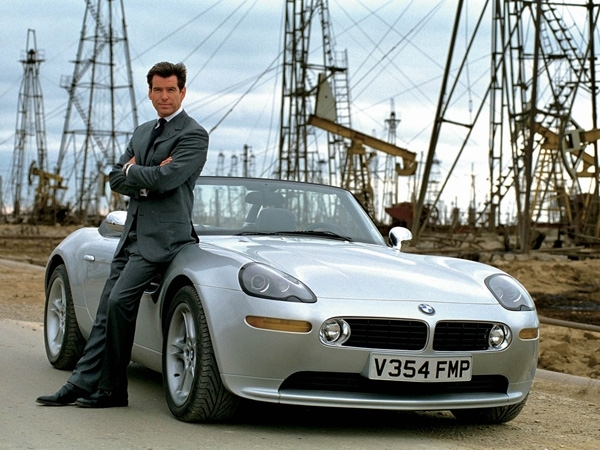 Among his best known creations are the Aston Martin DB9, Aston Martin V8 Vantage and the BMW Z8, which featured as Bond car in the 1999 movie The World Is Not Enough. The name Fisker became more widely known in 2008, when he unveiled his new car, the hybrid 4-door sportscar Fisker Karma, the first car built under the moniker Fisker Automotive, a partnership between Fisker Coachbuild and Quantum Technologies (now that sounds like a familiar organisation). 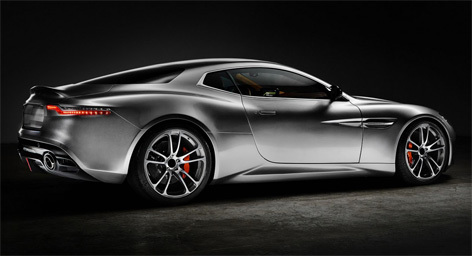 What do you think of the Aston Martin Thunderbolt? Share your thoughts below or on Facebook.